CIAA and SIAC title game spots are still up for grabs while the MEAC race gets thicker every week. It’s now or never in Division II football as title slots are on the line in both the CIAA and the SIAC. Things aren’t quite as definitive in the FCS ranks, but contenders are dropping by the week. 1. North Carolina A&T (8-0, 5-0): A&T had a bye week and still won last weekend, as Hampton’s loss to Bethune-Cookman put it in sole possession of first place. They’ll resume play in Norfolk where NSU will try to play spoiler to the Aggies dreams of a perfect season. 2. Grambling State (7-1, 4-0): GSU took care of business against Texas Southern at homecoming, putting up 50 on the winless squad. UAPB has two wins but has also dropped games to Mississippi Valley and D2 Central State so the win streak should hit eight. 3. North Carolina Central (6-2, 4-1): After a tough loss to Norfolk State, homecoming against Delaware State was just what the doctor ordered for NCCU. This week they’ll face stiffer competition in Hampton. 4. Howard (5-3, 4-1): Howard went on the road and got a win against South Carolina State, something that hadn’t been done in over a decade. Caylin Newton and Co. are still in the MEAC title hunt after their big win in Orangeburg, SC last week. 5. Southern (5-3, 3-1): After a slow start (1-3), Southern is quietly picking up steam with four consecutive wins after last week’s shootout with UAPB. It doesn’t get any easier this week as they take on SWAC West rival Prairie View. 1. 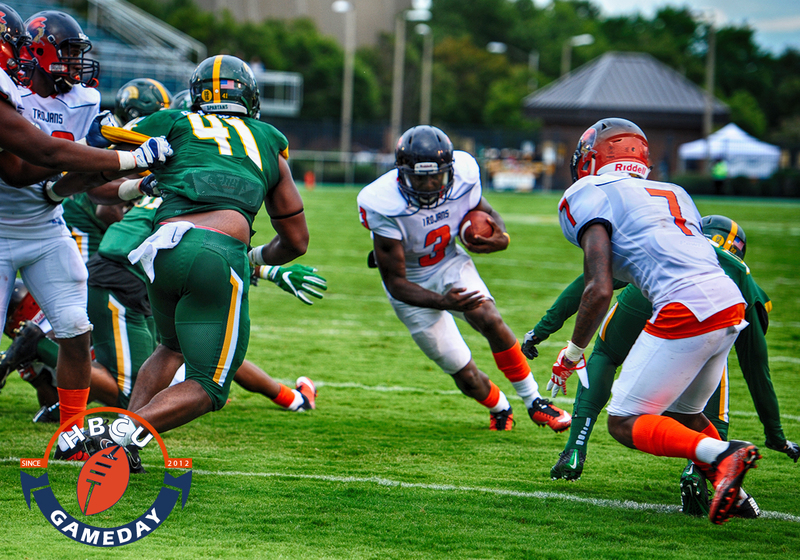 Virginia State (8-0, 6-0): VSU is on top for the third week in a row, but it nearly fumbled that away along with their unblemished record in a dogfight with Chowan. Please believe rival Virginia Union will be out for blood as a win would put the two teams in a tie and possibly Bowie State if it beats ECSU. 2. Bowie State (8-1, 5-1): Many people, including myself, wondered if BSU would put up 100 against Lincoln. BSU only came up with 86 points, but Elizabeth City State is capable of giving up big numbers as well. The Bulldogs will be rooting for VUU in hopes of getting a shot at the CIAA title. 3. Langston (8-0): One of just eight NAIA teams left without a loss, Langston held off Panhandle State for a 27-14 win and is just two victories away from a perfect regular season. 5. Miles (6-3, 4-1): That’s right, once again, the SIAC West’s title shot goes to the winner of ‘Skegee and Miles.